2. Donate ONLINE using your St. John XXIII FACTS account. 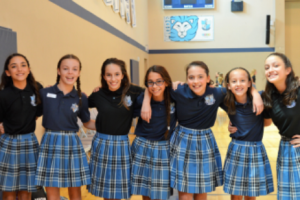 At Saint John XXIII Catholic School the dedicated faculty and staff work tirelessly to prepare the students to excel academically, socially and spiritually in a warm and caring environment. 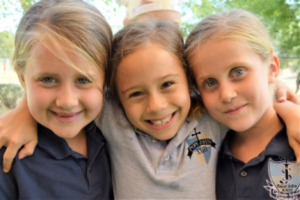 The school takes great pride in educating the whole child and preparing them to live successful lives in which service to others and love of Christ is the norm. We all have a story or a memory that is special to us when we recall our time at Saint John XXIII. Perhaps it is our child reading at Courtyard prayer or the songs of joy sung at mass. Perhaps it is a demonstration your son did with the iPad or the pride your daughter felt when she brought home her spelling test. Maybe it was the lessons they learned collecting food and supplies for those in need. We all have our reasons for being here at Saint John XXIII Catholic School and your support of the Annual Appeal is a way to say; Yes! 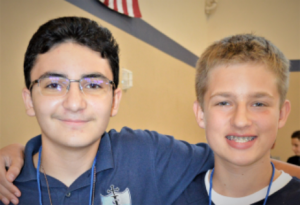 We value our Catholic school experience and want to see it continue. What is an Annual Appeal? Founded in 1999 the school used an Annual Appeal as the cornerstone of its fundraising efforts. Giving a planned gift (payable in a lump sum or over time) allows our parents to avoid the nickel and dime fundraising often associated with schools. It further allows the community to support the school in an anticipated and planned manner. Where will our gifts be used? Gifts will be used for additional safety initiatives to the campus, to fund improvements to the technology fund, on-line resources for the library, tuition assistance to those who are experiencing true financial difficulties at this time as well as the preservation of our music and art programs Who is asked to participate in the Annual Appeal? Parents, Grandparents, faculty, staff, friends and alumni all play a major role in the success of this Appeal and therefore the future of Saint John XXIII Catholic School. How can we donate to the Annual Appeal? There are many easy and secure ways. You can now donate securely online at Ways-To-Give, by returning the donation form in the mail or to the school office, or if it is easier just call the finance office. What kind of a gift are we asked to give? Any and all gifts are greatly appreciated. We realize that some can give more than others. Our hope is that everyone will take part with prayer and monetary gifts when possible. The total sum needed to continue funding our current programs, campus needs, and operating expenses for this current year is equivalent to approximately $600 per family. Please be as generous as you can and know of our appreciation. How can I involve others in this appeal? If you have family members, friends or business associates who wish to support the wonderful work of our Catholic school please stop by the school office to pick up additional material. Our Annual Appeal is an excellent charitable donation. Many companies will match your gift to St. John XXIII. The process is simple, just check with your employer to see if they participate in a Matching Gift Program and follow the steps to participate. Your gift may bring twice the benefit to our community. St. John XXIII is an excellent partner in our community and we encourage corporations to take part in our Annual Appeal which allows us to educate the whole child and develop the leaders of tomorrow. We would be happy to share information about the school and this appeal to anyone interested. Feel free to contact the Development Office for more information. Yes! 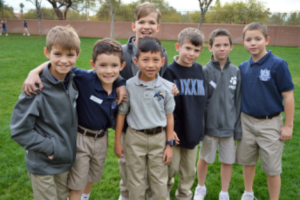 Saint John XXIII Is a 501(c) 3 and all donations to our school can be deducted on your taxes. We ask you to consult with your tax advisor to receive the maximum benefit from your generosity. and for this safe place for our children to learn and grow. Saint John XXIII Catholic School. and purpose of our school’s Annual Appeal. For more information, please contact the Development Director, at 480-905-0939.